This pattern is available from etsy.com for $5.00. This pattern is for Ruchika, the Serpentine. Ruchika the Serpentine is an Ichchadhari Naagin, a magical shape-shifting snake born in the deserts of India. 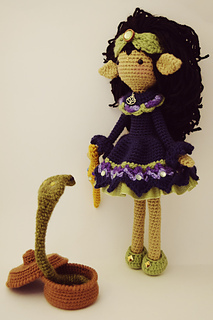 After completing 100 years of her life as a venomous cobra, Ruchika gained the ability to shapeshift. Like most Ichchadhari Naagin, Ruchikia assumes a human form most of the time. With her beauty and magic she has enchanted the most skilled snake charmers, and learned their craft, allowing her to charm other Naagin using a flute of her own mystical design. 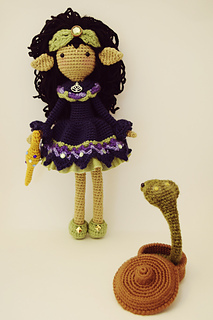 Ruchika is a nearly seamless crochet doll; her arms must be sewn on using the amigurumi seamless join technique. 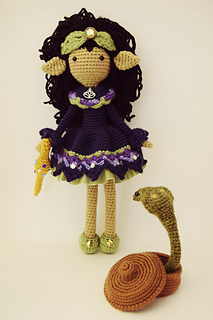 Also, I do not use wires in my designs, and she is solely stuffed with polyester fiberfill. 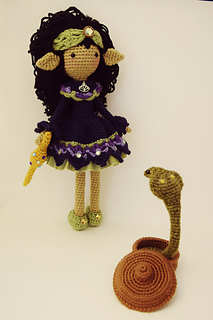 Size: With worsted weight yarn and a 2.25 mm crochet hook, Ruchika is roughly 11.5 inches tall and between 1 to 2 inches in width. She works up very quickly. The pattern is in PDF format. The document is 25 pages in length and includes detailed instructions and numerous photo tutorials to guide you through the process of creating her. The PDF file will be available to download as soon as you submit your payment (instant download). 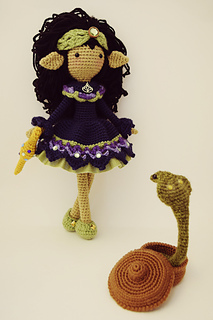 Also, if you have any questions while crocheting Ruchika, feel free to contact me.